Definition at line 168 of file conmsg.h. Definition at line 177 of file conmsg.h. Definition at line 170 of file conmsg.h. 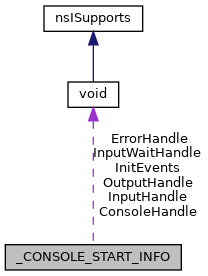 Referenced by ConDllInitialize(), ConSrvAllocateConsole(), ConSrvConnect(), and ConSrvInheritConsole(). Definition at line 174 of file conmsg.h. Referenced by ConSrvConnect(), and CSR_API(). Definition at line 175 of file conmsg.h. Referenced by ConSrvAllocateConsole(), ConSrvInheritConsole(), IntAllocConsole(), and IntAttachConsole(). Definition at line 172 of file conmsg.h. Definition at line 171 of file conmsg.h. Referenced by AllocConsole(), AttachConsole(), ConDllInitialize(), ConSrvAllocateConsole(), and ConSrvInheritConsole(). Definition at line 173 of file conmsg.h.